ND: How Really Triple Gem Bless us? How Really Triple Gem Bless us? When we take refuge from someone or something it gives us many meanings. 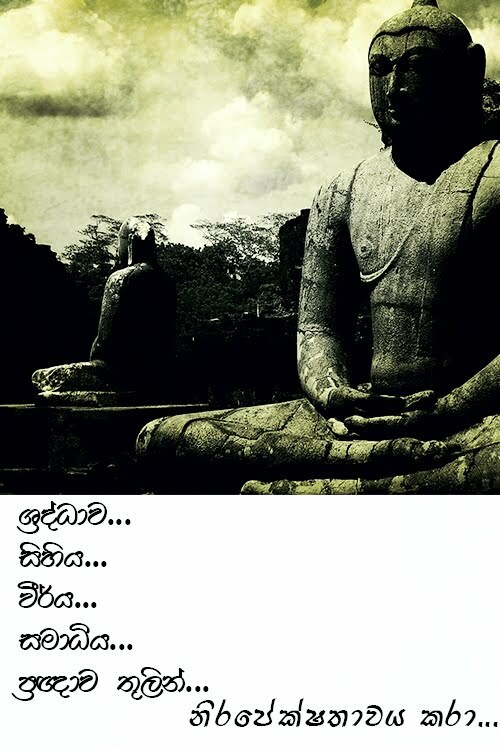 We can also take “following someone else’s foot step” which gives the meaning that “someone is doing the exact behavior which someone else’s or mostly parents did and take refuge through it for his or her lives.” But when we take the word “Sarana” in Sinhalese which gives the simple meaning of “Protection” has another deep hidden meaning. It gives the meaning of “ending the continuation of our life circle” OR the “theory of continuation / continuation of life circle” likewise there are 2 meaning for every word according to Dharma. 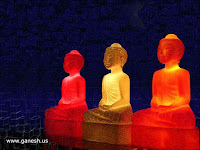 The Triple Gem - The protection of Buddha, the protection of Dharma and the protection of Sanga are the triple gem. By now you may know very well that all these phrases have two meanings. One is worldly, will guide you to a better life but with defilements and have reasons to continue this life circle. The other one is extramundane (not worldly) and will guide you to the Nirvana! So when we take “blessings of triple gem” there also these 2 meanings are exists. So let’s clear the both meaning and obtain the exact blessings through Triple Gem. In the Sutra Dajagga lord Buddha said “if someone feels scared or helpless remind me”. And also Lord Buddha has introduce the Buddha through nine eternal qualities like “Itipi – so baghawa – arahang – samma sambuddo – wijja charana sampanno – sugatho – lokawidu – anuttaro purisadamma sarathi – satta deva manussanag – buddo – bagawathi”. But what we really follow today? When we say “Buddhang Sranag Gachchami” we remind a person or a picture which we believe he is the lord Buddha with 32 characteristics and expecting a protection from him. There is no evil come through this habit as if someone feel even a tiny true respect or a faith about Buddha is a reason for him or her to become a lucky one and gather more purity for his life circle. But a person who takes the maximum advantage through a meaningful dharma is a person who always takes the lead and he always step ahead among others. We should know that even if we remind a person or a picture which we believe he is the lord Buddha with 32 characteristics we lead to the same eternal 9 qualities of Buddha. Lord Buddha once explain the Bhikku call Wakkali “My dear Wakkali, there is no use by staring at this dirty and destroyable body of mine! If someone practices the true dharma he or she can experience & see who really Buddha is” Lord Buddha himself explained that the person with 32 characteristics is also unclean and destroyable as others and that unique body also destroyable like anyone else’s body. Then he explained to see the real Buddha it is necessary to practice the true dharma! And this deep explanation was for those who with a knowledge about dharma and to kids and those who with not a grown mind he created the Buddha’s image. Once this happen for a kid name Mattakundali and when he was near to die the Lord Buddha happen to create a image of him for the kid and the kid got a really a pleasant thought with respect as his last thought and became a God once he died. Through these stories we can obtain a one truth. That is everyone is getting the Buddha’s blessings and protection in many ways in any time. Why someone feel he or she is protected by reminding Lord Buddha through his 9 greatest qualities? Lord Buddha is someone who already gets rid of desire / Raga, hatred / Anger / Dwesha and ignorance / Moha. So he never scared for anything or anyone. When we remind such a person with greatest qualities we too feel protection by heart and we get that assistance through those qualities. “Nattimain saranag anghang Buddho main saranag warang” is a phrase we all know in present and we use this for say “there is only one protection for us and that is Buddha’s protection”. Through this again we get an individual protection by remembering the Buddha & his body with 32 characteristics. 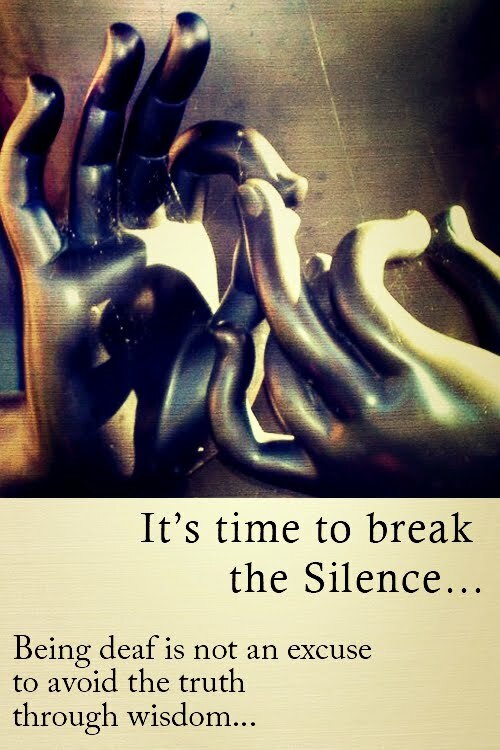 We should think how meaningful this phrase according to the Dharma. Lord Buddha said himself that “Nobody but you can save yourselves. You, when well disciplined yourselves, become your own savior. And Buddha only shows the path.” So now think! How suitable to say that only Buddha can save us and there is no one else who can save us. Aren’t we ignoring the greatest Buddha’s teaching? Don’t we feel like that Buddha is following us like a father to a child to protect us in each step? Aren’t we feel that Buddha come to this world for protect us in our day to day life matters? So we should know what exactly is this Buddha’s protection? First let’s clear the worldly meaning, which will guide us to a better life but with defilements and have reasons to continue this life circle. If someone has a sense of a mind which recognize the right things & the wrong things in their lives and the society we call he or she is “Intelligent”. There are many levels to this wisdom. There is a level which someone recognizes the right & wrong things with the reasons for them. He knows why something is right and what are the result gain through it and what are the wrong thing and the reason for it to be a wrong thing and the results gain through it. This nature of wisdom we call Buddha. Buddha we can explain in detail like this; the all wise or the wisdom which knows all about entire universe or the wisdom of omniscience is BUDDHA. And those disciples of the Buddha have wisdom to understand the things wisely through those teaching. We call this disciple’s wisdom or disciple Buddha. This is the exceptional Buddha and let’s learns about these later and let’s discuss about the worldly Buddha and how we obtain its protection. So this worldly Buddha also a level of wisdom and when someone is wise and do wise things he or she will never get useless results. This wisdom or this Buddha is the protection for everyone without any religious views or without any nationality views. This is the worldly protection of Buddha. This doesn’t mean that entire world should become Buddhists! Now think! If someone works wisely will he or she get the wise results? Which is the best way to do our worldly activities; wisely or foolishly? Don’t you feel now that the protection of Buddha should be with all of us to get the best results from everything we do? I guess now you understood that Buddha should be with us and its protection should be with us all the time to be successful in this world. How someone get the idea to invent or create things? The Buddha the wisdom of his or her helps them to get that thought. And a wise person’s choices always lead to the success. But some people use their wisdom for destructions. They invent things to destroy others. These are levels of wisdom and a real wise person always know how to use his or her wisdom wisely and show the accurate results which always helpful for others and to the world. And that person took the maximum protection of Buddha! Now what is this worldly protection of Dharma? When someone takes the protection of Buddha he or she discovers a system to follow the steps to gain the successful results. His or her wisdom guide them to achieve the best results through the procedure. There is a one universal dharma. It is that the good cause always gives the good effect and the bad cause always gives the bad effect. And this path gets cleared through the way we use our wisdom. This explains that everything has a system or an exact path which lead to the final results. That path or the system is the Dharma and when someone figured that system or the path out through his or her wisdom or the Buddha they get the protection of Dharma! Then what should be the worldly protection of Sanga? If someone thought to build a vehicle he or she gets many thoughts to build the vehicle till he or she get the final correct results. Through the wisdom they got the idea to build a vehicle and through that idea they are getting a system to follow for the best results. Even they get many ways to fix the engine finally somehow they know to fix it correctly according to the system. Even they get many ways to fix tires for the vehicle finally they get the idea to fix it correctly and wisely to get the maximum use out of them. Likewise somehow we get the best results when we get the protection of Buddha (wisdom) and the protection of Dharma (wise path or the system). This result is the Sanga. This result is the protection of Sanga. So through these explanations you understood the worldly triple gem. You may know by now no one is successful in this world without these three protections which is Protection of Buddha, Protection of Dharma and the Protection of Sanga! And your intelligence can be measured through the results you & the world gain by the way you utilize these protections! Don’t forget the UNIVERSAL DHARMA; THE GOOD CAUSE ALWAYS GIVES THE GOOD EFFECT AND THE BAD CAUSE ALWAYS GIVES THE BAD EFFECT. No matter how visible is the result for your 5 senses but this universal dharma doesn’t change! Now we know the worldly meaning, which will guide us to a better life but with defilements and have reasons to continue this life circle. But to save us through this protection and become our own savior we must know the other meaning which is extramundane (not worldly) and will guide us to the Nirvana! We should know the exact dharma and follow in accordance to achieve Nirvana! That gives the meaning which we should know the extramundane meanings well to follow the path and achieve the best results. Then let’s learn about the meaning of Arya Buddha, Arya Dharma and Arya Sanga which gives the protection to become our own saviors. First we should know who LORD BUDDHA is as he is the one which showed us the path to save ourselves. The Lord Buddha understood the Buddha in a very remarkable way. He had to discover very special qualities name “Paramitha” and practice them throughout countless years with an exceptional thought which he got into his mind to become a Buddha to explore the path to save ourselves. Through those understanding & experiences he become an omniscient and also achieved the greatest results of enlightenment as the greatest Arihat who is very unique. He achieved the unmatchable Buddha and its utmost protection to the fullest! And who are we? We can become the “Disciple Buddha (Shrawaka Buddha)” of Lord Buddha. The Lord Buddha who achieved this utmost protection of Buddha to the fullest has explained the eternal TRUTH in this universe. The “Four Noble Truth / Chathur Arya Sathya” (let’s discuss about this in future) which describe the eternal truth of this universe. Once we listen to those teachings and know about this Four Noble Truth we decide to enter the path which guide us to save ourselves. To achieve the highest results of this path we should understand the Arya Buddha and to understand Arya Buddha we should know the Four Noble Truth very well! The Lord Buddha has explained “Dukkha Arya Sathya (the suffering is exists), Dukkha Samudaya Arya Sathya (there is a cause for suffering and it is craving /Thanha / attachments), Dukkha Nirodha Arya Sathya (the cessation of suffering is achievable) and the Dukkha Nirodha Gamini Patipadha Arya Sathya (the path to the cessation of suffering). We should understand this dharma and attain nirvana by following the described path as a disciple and become Arihat by achieving the highest result at the end. For this we should listen to a real Dharma from a true Kalyana Mitta (the person who truly shows the path to end suffering of yours as a true friend) and we should revise the dharma we listened wisely by using our own mind and wisdom and we should enter to the path which end suffering and follow the path wisely till we achieve the goal. Once we complete the process we created the environment to get the protection through Arya Buddha, Arya Dharma & Arya Sanga. When someone understood this Four Noble Truth through this wisdom he has used the Arya Buddha for his protection. Then he can say “Buddhang Saranag Gachchami” with its true meaning and get the true protection for his or her life. Let’s learn the Arya Dharma Protection through the Arya Buddha Protection! Through the wisdom of Four Noble Truth we learnt through a Kalyana Mitta (True Friend) we understand the “the suffering, there is a cause for suffering and it is craving /Thanha / attachments, the cessation of suffering is achievable and the path to the cessation of suffering by our own mind and wisdom. Once we get this understanding we got the “Eye of Dharma” according to the Dharma we have seen the Dharma. But still to be following the path and achieve the goal. To complete the process we should get rid of defilements through the wisdom and meditation. What we should learn here is once we understood about the Four Noble Truth as above we got the first Arya Buddha’s Protection to our life. And now according to the universal theory we get a system / the path to follow. That is the Arya Ashtangika Margaya / the Eight Fold Noble Path. Once he or she knows about this Eight Fold Noble Path he or she is aware of Dharma path. He or she realizes that there is a faithful path to end suffering for sure. It shows as “Atta deepa viharatha – atta sarana anannya sarana” means “become a lamp for you – become your own light – there is no one to save you or help you – get the help from Dharma and stay with it to protect yourself.” You get this deep meaning through the wisdom when you are protected by Arya Buddha. Once you understood this Dharma path you are protected by Arya Dharma. There is one thing we should aware again that is again we have 2 meaning for Eight Fold Noble Path which one is worldly, will guide you to a better life but with defilements and have reasons to continue this life circle. The other one is extramundane (not worldly) and will guide you to the Nirvana! So when you revise above mentioned facts wisely you know that knowing about, the Four Noble Path is the first protection of Arya Buddha. Through the “Eye of Dharma” you know about the path to follow which is Eight Fold Noble Path and that is the first Protection of Dharma. When we get the protection of Dharma we occur to get rid of Desire / Hope / Craving (Ragaya), to get rid of Anger /Hatred/ thought of conflict (Dweshaya) and to get rid of ignorance/false vision (Mohaya) and finally we can attain Nirvana! This means we become to the state of Sanga as the result. “Yadidan Chattari Purisa Ugani Atta purisa puggala Esa bagawatho Sawaka Sango” means the state of Sanga. There is no difference between Bhikku Bhikkuni & Devotees when they come to the state of Sanga. There are four levels which we complete through the process of attaining Nirvana. Those are Sowan, Sakurdagami, Anagami and Arihat. He is a person who completed levels means he becomes an “Arya Shrawaka” which means the disciple of Lord Buddha through following his shown path & achieving results. There is no barrier to complete all these levels as normal domestic persons who those are not become Bhikku Bhikkuni yet. Somehow when a person achieved these levels means he becomes the status of Sanga. And this Sanga is the Arya Sanga and its protection. So let’s clear our protection path again! To get the protection of Arya Buddha we should understand the Four Noble Truth! To get the protection of Arya Dharma we should understand the Extramundane Eight Fold Path well! To get the protection of Arya Sanga we should understand what is Nirvana and what is the flame of this world first. And we should extermination the flames and realize / achieve Nirvana as the final result! I request protection from the Buddha for the 2nd time. I request protection from the Dhamma for the 2nd time. I request protection from the Sangha for the 2nd time. We know what exactly we mean through these. We understood the Arya Buddha, Arya Dhamma & Arya Sangha and how we should protect by them. When Lord Buddha is here many people listen to his Dharma and achieved the level of Sowan as the first Dharma level. And those who achieved that level said a phrase to express their joy for that knowledge they gain. In here they used to say like this with the pleasant and respectable thought for Lord Buddha. And they came as worldly people for listen dharma and while they here the true dharma they got the Eye of Dharma and understood the truth as a result of listening & revising wisely. Once they clear with the mind that dharma is the only way to survive and it is the only suitable path to follow and save ourselves they enter to the path by showing their happiness through such a phrase. These people complete their Eight Fold Path with practice and become wiser and realize the Four Noble Truth and attained Nirvana successfully by being Arihat! At this very moment we should realize one main fact through all these details in this page. That is this Meaningful Triple Gem blessed & helps everyone to be successful and perform things without high desire, high hatred & high ignorance. We should clearly realize that there is nothing call “DESPONDENCY” nor “DISAPPOINTMENT” nor “DISGUST” nor “DISPLEASURE” in Real Buddhism and nor move stealthily to the jungle after being ascetic through those disappointment or disgust for life or world! Many are mislead through this thought about Buddhism and they think the final result in Buddhism is this disappointment and meditating somewhere in jungle without having courage to face the problems in this world. But through the REAL BUDDHISM we will know the eternal truth! After knowing that truth we realize the next step to be taken. Many who don’t realize this truth collect things by thinking they are valued and eternal. They are stuck in an illusion which covered by beauty, taste, fragrance, smoothness and pleasant thoughts. And they think that is they world and day by day they ask for troubles through them. And they think that is the life and we should have courage to fix those so call problems which is never fixable. And they lose their comfort and gain stress… but they never give up the HOPE to find comfort through this existence. They spend more money to comfort them… and they again increasing their stress through finding money to that comfort… and they put blame for the family… blame for the country… blame for the government… etc.. etc… and never try to end this stress. The one who gathered knowledge through Dharma will understand this small but hidden fact in this life. And they stop finding comfort through their existence and they are stop doing all those unnecessary things to comfort them by knowing that is useless. They take the maximum use from the TIME and they work out for their freedom. The one who think this world is the most valuable place and who attached to it most is trying to collect everything for “I” and he will do the maximum to keep “I” happy by destroying others and doing the evil things. This act cause to increase the crime of this world and also to increase the competition. There is no use to threaten or warn them to not do all those crimes as they are ignorant and stuck in this illusion. Buddha never forced anyone to stop crime and follow the path as he knew it is useless. But Lord Buddha explored the truth for everyone. The eternal universal truth! And he asked us to understand it and save ourselves. He knew that many in this world are wise enough to see this truth. He knew that many will stop crime by their own understanding and will guide them to the freedom. As that feeling comes inside of them they will never turn back to do crime or to that illusion again. So like those days those wise people are still in this world and it is more than 80% out of whole population in this world. Only thing we should do is explore this truth to them and letting them to think by themselves to realize it. 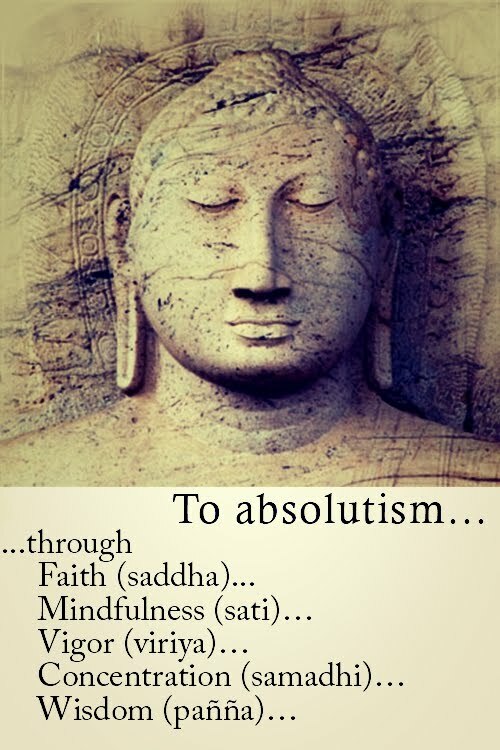 Being a Buddhist is not being a part of just another religion. Being a Buddhist doesn’t give the meaning of being a part of a religion or nation. Being Buddhist is being wise and intelligent. Those who intelligent and guide them to see this four noble truth is a Buddhist! After being a Buddhist they never delay to practice the eight fold path and save themselves. And being Buddhist means one can discipline his or her selves without any effort and the disciplines comes within them… it comes inside of them… and those are wise. Lord Buddha said everyone is developing their 7 Bojjhanga equally whenever one listens to the real dharma. If this happens that means we do the highest meditation while we listen to the Dharma. That moment will make us to realize the eternal truth and attain nirvana too! That is how in Buddha’s period people achieved level of this path while they listen to the Dharma. May all of you get the real blessings of Triple Gem & attain Nirvana by ending this endless suffering! Please tell me how to find a "kalyana mitta" who can give me the key. More than looking for a "Kalyana Mitta" I think we should concentrate on what we listen as dhamma. Identifying a "Kalyana Mitta" is not easy for a normal human being. So always better to concentrate on what you listen as dhamma, whether they helpful for you to get rid of desire, hatred & ignorance.